On December 8, 2010, a young local hero will be making a triumphant return to his hometown. He is said to be unassuming, workmanlike, always smiling, and 6' 2". 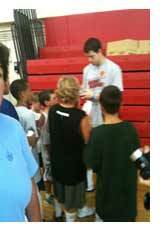 Jimmer Fredette, a Glens Falls graduate, will play as the senior guard on the Brigham Young University team in their game against the University of Vermont in a men's NCAA college basketball game at the Glens Falls Civic Center. Locally beloved Fredette has progressed from his impressive high school basketball career - a Section II scoring record, State Finals in 2007 - to even greater success as the senior guard of the Brigham Young University Cougars basketball team. Last season, with the help of Fredette, the Cougars celebrated an unprecedented 30 victories, and made it to the second round of the NCAA tournament. His achievements as an individual player are no less astounding - last season, he was named to the first-team all-Mountain West Conference, and to five All-America teams. 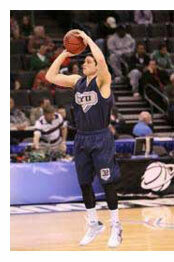 He considered the NBA draft, but decided to return to BYU for his senior year to finish his studies. Though University of Vermont is officially designated the "home" team, it is apparent that local support for the returning prodigal son makes BYU the home team in the hearts of Glens Fallsians. Tickets to this "Hometown Classic" will be on sale starting September 18, 2010. Prices range from $30-85; $30 for end seats, $45 middle, $60 courtside, and $85 courtside. Standing room tickets will be available for $20 only after all seats have been sold. Since only a limited number will be available online, it is recommended that you buy tickets from the Civic Center Box Office. For those who can't make the game, it will be broadcast live on KSL Newsradio 102.7FM and 1160AM, with a possible TV broadcast. Following the game, there will be a meet and greet with both teams in Heritage Hall, where some can meet Jimmer Fredette for the first time - and others can reunite with a familiar friend.